Road trip to Kimberley with baby: The good and the bad! First Trip: To the Mountains! 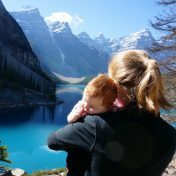 How to travel with a toddler and make it a success for all! Can we just pause for a minute and reflect on how much baby stuff is out there… it is actually out of control! When you are a first time mom, like me, I am sure you also felt like… “ok but what do I ACTUALLY need? What will my baby ACTUALLY be entertained with?” Now obviously every baby is different but here are the top five things that I found effective! If you can borrow these from a friend or get them used… all the better, because as you will see most of the stuff is only used for a limited time period! If you go onto pinterest or google there are tons of great tips on how to clean used/borrowed gear! When H was new all she needed was some cuddles and maybe the occasional bright light to check out… things have changed rather quickly! Here are the top 5 things I cannot imagine not having! Tummy time mats/ baby active gyms (whatever you want to call them)… You can go all out with these. While they are the greatest things in the moment they really only use them for a short time. If you want to go all out have at it, but if you want to get a more budget friendly version that is fine! I really liked that mine came with a tiny crescent shaped pillow… it helped for tummy time when she got a bit stronger (similar found HERE). We have put ours away in storage since she was about 5 months… but I cannot imagine not having had one! Also our cat George was a huge fan. Foam letter mat… I randomly picked this up on sale and now I understand why everyone has them! As H has learned to roll she would sometimes bring her head down rather hard, and our house has hardwood… having a little padding has made me and her feel better about some of her “thunks”! It is also great for when she has a little spit up, rather than spitting up on the rug! And finally she loves to destroy it (hence me considering it a toy!). She figured out how to pull out the letters surprisingly quickly and finds this endlessly entertaining! Exersaucer… known in my circle of friends as “the circle of neglect”. This again is one of those toys that at the time I could/can not have lived without… but it only lasts a few months. We were lent two from different friends (thanks!). We started with just a few minutes and have slowly built up her time in it. Often she will be having a blast in her circle while N and eat dinner… one of them has some music button so we often refer to her as our DJ (similar here). She is not out of it just yet, but I have a feeling that time will come soon… and that will be unfortunate! Jolly Jumper, again I had a great friend who let me borrow hers. We have an older model that clips onto a door-frame. This works in our house, but if you live in a newer home you will want to get one with an independent stand. H Loves this! She gets a big crazy sometime jumping and yelling and just having a ball! Some sort of Chew toy – Sophie The Giraffe (or something similar) has worked great for us. She loves chewing on the poor giraffes face, as well as its legs, and ears. The squeaking has also caused a few giggles! Along with Sophie, H loves her vibrating raspberry! When she bites down it vibrates and she goes nuts! If you find safe chew toys that are wood… this seems to be what H and her baby friends are starting to really love … more on that in the future! Ok and one more… O’Ball Rattle. A random, cheap item, we picked up that H just loves! It was one of the first things she could pick up independently. Another popular toy with both baby and cat! haha sharing is caring! Good luck sorting through all the stuff! I was just talking to a mom co-worker of mine the other day and we decided that she needed to write a book about what to REALLY expect after you have a kid! This seems like something that needs to go in there. There is so much out there, but sometimes it does seem a bit outrageous… Let’s base thing in reality! I’d buy your friends book! It’s good to know! The choices are overwhelming! We have several of these and m daughter loves them as well. We do need to invest in a jolly jumper or one similar! She would love that! This is a great post! My best friend just had a baby girl and she was just talking about how much stuff she put on her registry and she hasn’t even used half of it! Great list! There are so many thing and it’s hard to know what you need and don’t need. I had the same exact feeling… I still find that actually! Stuck for dinner… try these three websites!